and energetic stylist with a desire to please the client and she adapts her skills to the ever changing trends in the industry very easily. 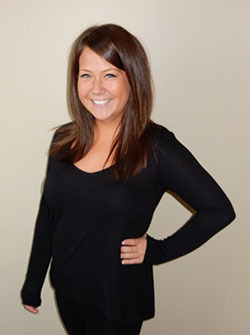 Her drive and desire is to build her clientele and be successful making connections and developing relationships with her clients here at Indigo. Rachel studied at Douglas J. Aveda Institute. After earning her license she has continued her education while being in the Indigo Stylist Associate program for 12 months, focusing on continuing to expand her knowledge base on applied techniques, skill sets and knowledge. Foundations of color with L’Oreal, Salon Owner Industry Coach Jo Blackwell-Peston Elements of Cutting by L’Oreal Fall 2015 Cutting Trends with Ron Lopez. She also has a passion for giving back to the community and enjoys using her talents to participate in community events and has taken part in events such as Children with Cleft Palate Event and Pampering Single Mom’s Event as well as Women with Hair Loss Charity Events. If your looking to experience a great service make an appointment with Rachel and allow her to make you feel amazing and confident with your new hairstyle or color application.